The Green Smoothie Challenge: I’m All In. – The Small Things. The Green Smoothie Challenge: I’m All In. So, over the past month and a half I’ve been making a decent effort to “get into shape”. I generally go to the gym 4 times a week and I eat alright. So far my legs have definitely slimmed down but not significantly, I also haven’t dropped a single pound. Which is frustrating. I know people say that muscle weighs more than fat ect. But common body, not even one pound?! I think the issue is my eating habits. Don’t get me wrong I love me some veggies but I also love pasta and bread and cheese and sugar. In addition, the veggies I eat are always cooked, I can’t remember the last time I ate raw veggies. So this morning I had an epiphany: that’s what needs to change. I need more raw and more green. Realistically overhauling my diet at this time of year is virtually impossible. So I’m not going to do that. I’m not cutting out life’s pleasures at christmas time. Instead I am going to add raw and green to my diet by taking the Green Smoothie Challenge! Here is how it works. Drink 1 green smoothie every day. It is that easy. Nothing else has to change. Drink your smoothie and eat normally. If there are cookies at the staff christmas party, have a cookie. If mom makes pasta for dinner, eat the pasta. The idea here is not to cut anything out but to add goodness. Green smoothies are packed with vitamins, water and all things wonderful. So by adding a green smoothie to your daily routine you are just adding extra goodness. My plan is to have a green smoothie everyday for breakfast. Since I am always super rushed in the morning it is easier for me to commit to this if I prepare ahead of time. So today I spent half an hour blending for the week. All the smoothies were then poured into Mason Jars and placed in the freezer. The night before I’ll move one to the fridge and it will be all ready to drink when I wake up! So what exactly is a green smoothie? Essentially it is a blended mixture that is one part green, one part liquid, and one part fruit. 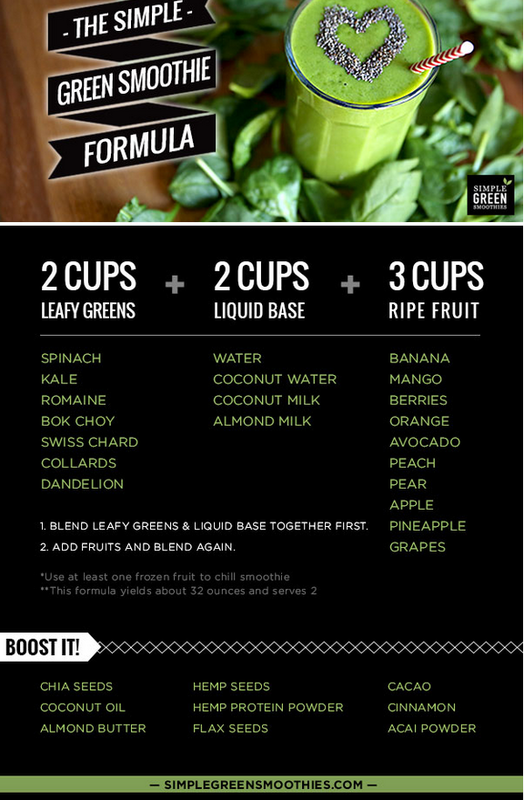 Check out this fantastic how to guide from simplegreensmoothies.com. For the smoothest consistency blend your water and spinach first and then add your fruits. If you are nervous about drinking spinach, don’t be. The flavour from the fruits completely counter act the taste of the spinach and the colour of these things are stunning. I am so excited to start and share this journey. Check back for more updates on my Green Smoothie Challenge. Share in the comments. Are you interested in taking part in the Green Smoothie Challenge?! What is your favourite green smoothie combination?